In June I hired a researcher using the genealogyfreelancers.com service to retrieve records for me. They are now starting to dribble in. So, today I will take a break from the Paris Expo series to post the first of my new records. Today I am posting the Death Register entry for Isaac Henry Kanistanaux. This document was provided by the Clerk in Fredonia Village, Chautauqua Co., NY. 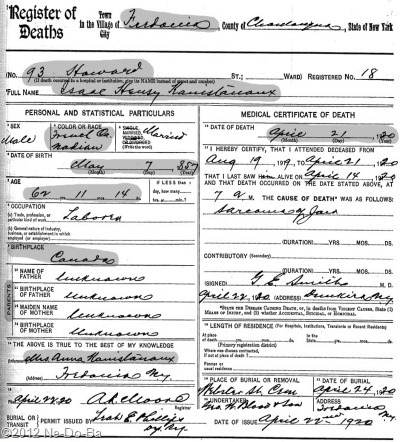 It is a photocopy of the actual death register entry created at the time of his death. Nothing earth shattering to report here but a couple of items caught my eye as worth mentioning. I am quite sure “Indian” was intended, but that is not what it says. The information was provided by his wife and census records show her as literate in the English language. Seems unlikely “Nadian” is what she really said, but that is certainly what the clerk wrote. This is a nice example of how we are all human and capable of making errors. In light of that, I suggest no record (no matter how official) should be seen as 100% correct or free from error. I now have his birth date from two separate sources; this death record and Laton’s Federal Claims paperwork. This does not guarantee the information is accurate but it does suggest this was the day he celebrated his birthday. Canada is still a very large region to search, but it may be possible to find a birth or baptism record for a Isaac Henry (or Henry Isaac) with a last name unknown, a birth date of 7-May-1857, and a location of Canada. I should narrow it down to Quebec first and try Ontario next. It is a long short, but certainly worth a try. But then, if I do find such a record using this method, how will I know if it is the right person? I will not know until I spend the time to research the entire family to see where they came from and where they spent the majority of their lives. I was very disappointed to find no detailed information about his place of birth, but even more so to find no information about his parents. His wife provided the information and she should have known the parents that raised him, Marleah and Laton. In most cases, I would expect to see at least the names of the parents that raised him. So, is Anna telling me they are not his real parents and his real parents are unknown. Or, perhaps no one actually asked her the question, so she provided no information at all and it was a clerk that wrote unknown rather than leaving the entries blank. Unless I can locate a marriage record that provides the names of his parents (which is unlikely in New York for this time period), I may never learn who Isaac Henry Kanistanaux really belongs to. So, once again, I have no new information but some new questions.